FIGURE 15: In vivo characterization of UvrA and UvrB proteins. (A) The example image of a single immobile UvrA-PAmCherry molecule localized and tracked at 15 ms exposures within five consecutive frames (top) and the example image of five consecutive frames showing fast diffusing UvrB-PAmCherry molecule (bottom). 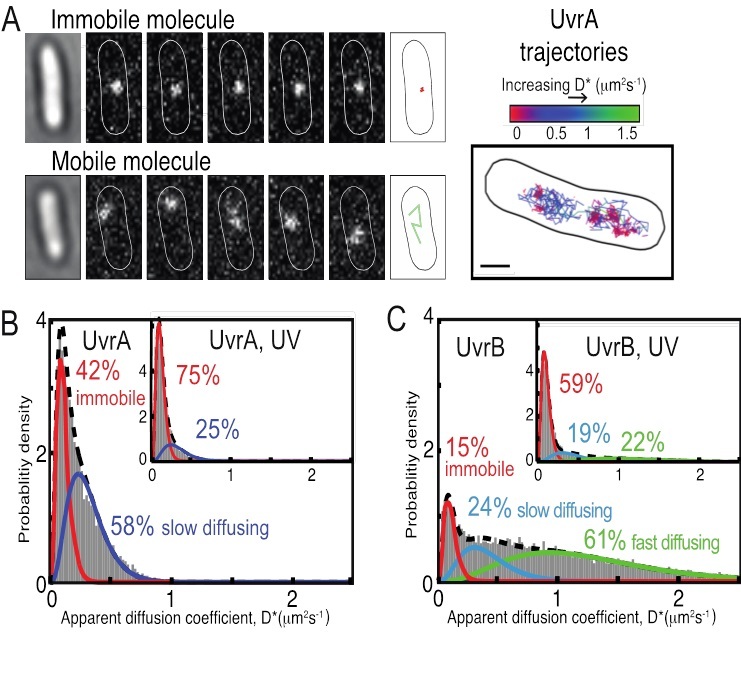 On the right, example cell is shown with multiple trajectories recorder for many individual UvrA molecules. (B) Distribution of apparent diffusion coefficients (D*) of tracked UvrA molecules, fitted with a two species model: first immobile, DNA-bound population (∼42%) and second mobile population of slowly diffusing molecules (∼58%). (Inset) The distribution of D* values of tracked UvrA molecules after exposure to 50 J m−2 ultraviolet light (UV). (C) Distribution of D* values of tracked UvrB molecules, fitted with a three species model established that ∼15% of UvrB molecules were immobile, ∼24% diffusing slowly and ∼61% fast diffusing. (Inset) The distribution of D* values of tracked UvrB molecules after exposure to ultraviolet light (UV).